Lipoid proteinosis (LP) is a rare autosomal-recessive genodermatosis, characterized by the deposition of amorphous hyaline-like material in different parts of the body, especially the skin and mucous membranes. Disfiguring lesions predominantly affect the facial appearance. No curative therapy and treatment options limited to symptomatic approaches are available. Facial disfigurement in this disease may have a huge negative effect on the patients’ psychology and quality of life. With this regard, the patients may benefit very much from the treatments that enhance their cosmetic outlook. We present a 19-year-old female patient with LP who came to us seeking treatment for her facial lesions. She was treated with a combination regimen of fractional carbon dioxide and non-ablative radio frequency with good clinical and aesthetic outcome. Lipoid proteinosis (LP) is a rare autosomal-recessive genodermatosis. It was first reported by Urbach and Wiethe in 1929, and termed as “Urbach–Wiethe disease.” The patient with LP clinically presents with hoarseness, infiltration, and thickening of the skin and the mucosa. Generalized visceral involvement can occur. LP has no effective treatment so far, but cosmetic benefit can be assured with fractional carbon dioxide (CO2), dermabrasion, and non-ablative radio frequency (RF). 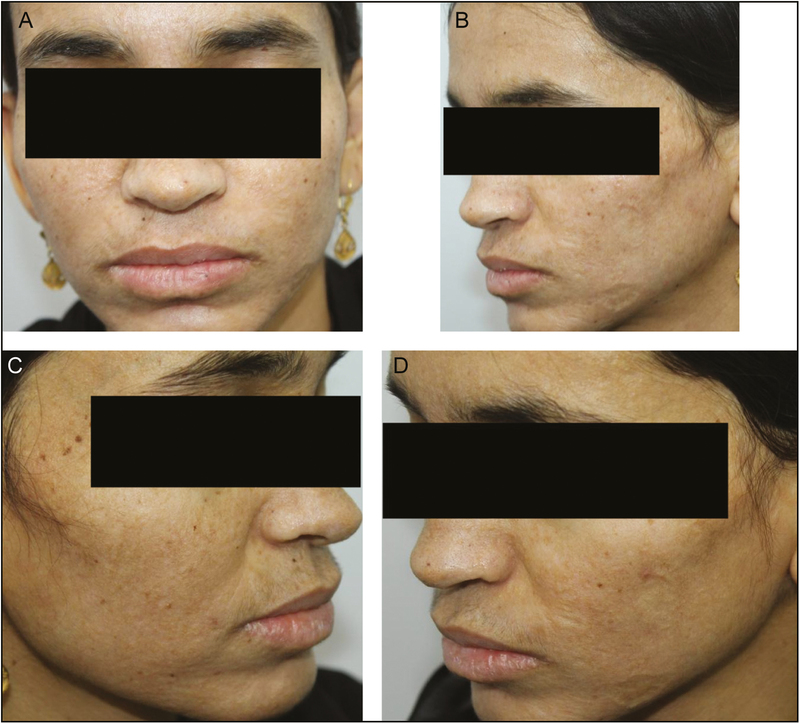 We report a case of LP, who mainly sought treatment for cosmetic improvement of the facial scars. A 19-year-old female patient presented to us seeking cosmetic improvement for multiple depressed scars on the face, which she had developed since 5 years. On examination, it was found that she also had minimal moniliform blepharosis, verrucous plaques on the elbow and knee, and hoarseness of voice [Figure 1]. Family history revealed that her sister was also having similar skin lesions. A skin biopsy from the lesion showed thickened periodic acid - schiff stain-positive homogenous hyalinized material in the dermis, consistent with LP. Her systemic examination was normal, indirect laryngoscopy showed deposits in the vocal cord. Complete blood count, renal, and liver parameters were in normal limits. No neurological symptoms were reported, and cranial computed tomography (CT) was normal. On the basis of these clinical data, she was diagnosed with LP and was counseled about the disease course and the treatment. The patient was depressed about her facial scars, and her parents wanted cosmetic improvement. After thorough counseling, we started her on fractional CO2 laser therapy. Ablative laser resurfacing(eCO2; Lutronic, Seoul, Korea) was done in dynamic mode at a pulse energy of 40mJ, spot density of 100 spots/cm2. Sessions were repeated once in 6 weeks for a total of 4 sittings. Non-ablative RF was performed every 2 weeks for six sessions for skin rejuvenation and tightening. At the end of 8 months, a very good subjective improvement was appreciated [Figure 2]. The eyelid papules were also planned to be lased in ablative CO2 laser to further improve the appearance; however, the patient did not wish to get it treated. Lipoid protienosis being a genetic disorder with on going disease process, we offered the patient a maintenance treatment with fractional CO2 every 4-6 months to abalate the hyaline deposits if any. LP is also termed as “hyalinosis cutis et mucosae” because of the deposition of homogenous hyaline-like material in multiple organs, including the skin, oral mucosa, larynx, and brain. The pathogenesis is unclear, but is shown to result because of mutations in the gene encoding extracellular matrix protein 1 (ECM1) on chromosome 1q21. Loss of ECM1 may have a role in the skin changes, including scarring, wound healing, and skin aging. One of the most remarkable clinical features of LP is hoarseness; it is the first symptom that is caused by the infiltration of the vocal cords by hyaline-like material. The skin lesions occur in two stages. The first stage consists of pustules, bullae, and hemorrhagic crusts of the skin, mouth, and throat, which usually appear during the first 2 years of life. The skin lesions resolve with pock-like or acneiform scarring, usually on the face and distal extremities. In the second stage, deposits increase in the dermis, and the skin becomes thickened, yellowed, and waxy. Beaded papules along the eyelid margins are characteristic findings. Verrucous lesions may occur on the extensor surfaces of the extremities, especially the elbow and the hands, commonly after frictional trauma. Infiltration of the posterior tongue and frenulum may result in restricted mobility to the extent of causing speech difficulties. Fault either in collagen synthesis or excessive degeneration leads to the reduction in the collagen levels in LP. The fibroblasts produce an excess of non-collagenous dermal proteins in the place of collagen. Overall, an increase in collagen types 4 and 5 and marked reduction in collagen types 1 and 3 are observed. The hyaline-like material seen in the dermis consists more of matrix glycoproteins and rarely of collagen fibers. A pathognomonic finding of LP is bilateral intracranial bean-shaped calcifications within the temporal lobe or hippocampus–amygdala complex. CT scan may be helpful in the diagnosis. Neurologic manifestations may include epilepsy and neuropsychiatric abnormalities. Several good clinical responses were reported with oral dimethyl sulfoxide, d-penicillamine, and retinoids,,, but none were curative. Dermabrasion and chemical peel applications are available for the treatment of scars, but these methods could provoke deposition of hyaline-like material. Few studies were reported, which were carried out recently for the assessment of various options available for the cosmetic improvement in LP. CO2 ablation of beaded eyelid papules was of good cosmetic results. Studies on Er:YAG (erbium-doped yttrium aluminum garnet) laser resurfacing for the facial scars of LP carried out every 6 weeks for two sessions had good cosmetic improvement within a follow-up period of 2 years. As there is no curative systemic treatment for LP, aesthetic improvement of the face can be crucial for the patients who are psychosocially affected. An applicable laser treatment option should ablate the skin precisely and reach deep enough to the papillary dermis, where the hyaline deposits are predominantly located. The absorption length of CO2 laser (10,600nm) in the skin is approximately 0.02mm, thus making it an apt choice for ablating the hyaline deposits in the papillary dermis. It also regenerates the collagen, helping in the improvement of pock-like scars after subsequent sessions. Due to its better tissue penetration, RF is capable of specific heating of the mid-to-deep dermal tissues. Specific heating of the hydrodermal collagen results in both collagen remodeling and skin tightening, thereby helps in improving the overall clinical appearance. Clinically, this dermal collagen stimulation helps in the tightening of the deep subcutaneous structures. According to our knowledge, this is the first case report where CO2 is combined with RF to give much better results than lasers alone, as discussed earlier by other authors. Hamada T, Wessagowit V, South AP, Ashton GHS, Chan I, Oyama N, et al. Extracellular matrix protein 1 gene (ECM1) mutations in lipoid proteinosis and genotype-phenotype correlation. J Invest Dermatol 2003;13:345-50. Bergenholtz A, Hofer PA, Ohman J. Oral, pharyngeal and laryngeal manifestations in Urbach–Wiethe disease. Ann Clin Res 1977;13:1-7. Nayak S, Acharjya B. Lipoid proteinosis in a six-year-old child. Indian Dermatol Online J 2012;13:25-7. Thaddanee R, Khilnani AK, Pandya P, Chaturvedi M. Lipoid proteinosis (Urbach–Wiethe disease) in two siblings. Indian Dermatol Online J 2014;13:95. Hamada T. Lipoid proteinosis. Clin Exp Dermatol 2002;13:624-9. Harper JI, Duance VC, Sims TJ, Light ND. Lipoid proteinosis: an inherited disorder of collagen metabolism? Br J Dermatol 1985;13:145-51. Kleinert R, Cervós-Navarro J, Kleinert G, Walter GF, Steiner H. Predominantly cerebral manifestation in Urbach–Wiethe’s syndrome (lipoid proteinosis cutis et mucosae): a clinical and pathomorphological study. Clin Neuropathol 1987;13:43-5. Wong CK, Lin CS. Remarkable response of lipoid proteinosis to oral dimethyl sulphoxide. Br J Dermatol 1988;13:541-4. Kaya TI, Kokturk A, Tursen U, Ikizoglu G, Polat A. D-penicillamine treatment for lipoid proteinosis. Pediatr Dermatol 2002;13:359-62. Akoglu G, Karaduman A, Ergin S, Erkin G, Gokoz O, Unal OF, et al. Clinical and histopathological response to acitretin therapy in lipoid proteinosis. J Dermatolog Treat 2011;13:178-83. Brajac I, Kastelan M, Gruber F, Peris Z. Hyalinosis cutis et mucosae: a 30 year follow up of a female patient. Eur J Dermatol 2004;13:310-3. Rosenthal G, Lifshitz T, Monos T, Kachco L, Argov S. Carbon dioxide laser treatment for lipoid proteinosis (Urbach–Wiethe syndrome) involving the eyelids. Br J Ophthalmol 1997;13:252. Çalıskan E, Açıkgöz G, Tunca M, Koç E, Arca E, Akar A. Treatment of lipoid proteinosis with ablative Er:YAG laser resurfacing. Dermatol Ther 2015;13:291-5. Mihashi S, Jako GJ, Incze J, Strong MS, Vaughan CW. Laser surgery in otolaryngology: interaction of CO2 laser and soft tissue. Ann N Y Acad Sci 1976;13:263-94. Zelickson BD, Kist D, Bernstein E, Brown DB, Ksenzenko S, Burns J, et al. Histological and ultrastructural evaluation of the effects of a radiofrequency-based nonablative dermal remodeling device: a pilot study. Arch Dermatol 2004;13:204-9. Available from: http://archderm.jamanetwork.com/article.aspx?doi=10.1001/archderm.140.2.204. [Last accessed on 2018 Jan 30]. Royo de la torre J, Moreno-Moraga J, Muñoz E, Cornejo Navarro P. Multisource, phase-controlled radiofrequency for treatment of skin laxity. J Clin Aesthetic Dermatol 2011;13:28-35.